Last week, the eOriginal team was out in force at MBA Tech 2019. We enjoyed seeing old friends, making new friends, discussing digital best practices and learning what is top of mind when it comes to mortgage technology adoption. Do something that is going to impact your industry forever. This resonated with me as it largely aligns with the current state of the industry. Digital mortgage technology is not just about gaining one benefit. It’s about the myriad of benefits that come with an end-to-end digital mortgage process. Fortunately, the ongoing adoption of digital processes that is taking place today will have a lasting impact on the mortgage ecosystem. Shifting gears, a highlight of the conference was eOriginal’s demo in the Tech Showcase. Last year at MBA Tech 2018 in Detroit, we demonstrated what we were bringing to the market. This year, we highlighted the evolution of the market and proved that the promise of digital mortgage is in fact a reality. To do this, we focused on a real-life scenario that recently took place—a digital closing in Texas. Dennis Pospisil is Senior Vice President at Republic Title of Texas, the settlement agent that conducted the digital closing. He joined eOriginal’s Chief Product Officer, Simon Moir, and Senior Product Manager, Alex Tepe, on stage for a six-minute Q&A-style presentation. Moir and Tepe asked Pospisil about his experience with the digital closing as well as what he had to do to prepare for a paperless settlement. Believe it or not, Pospisil found out that the closing would be digital just 24-hours ahead of time. Throughout the conversation, he emphasized how easy the process was—it required no training, no contract, and no fees. An iPad was used for the closing, but any type of connected device with a browser and sufficient screen capacity could have been utilized. DocsDirect, the document prep provider, delivered the lender docs, as well as a one-page training document for Republic Title of Texas. A bonus highlighted by Pospisil was the borrower’s excitement over the ease and convenience of a digital closing. Clearly, all parties involved were more than satisfied with the experience. So why are electronic notes important to digital adoption? An eNote is an electronic version of what has traditionally been a paper document. Since it is electronic, it needs to be created, signed, and managed in a specific way to ensure that it has the same legal enforceability as paper. This is the most critical document for all parties in the mortgage ecosystem, including lenders, originators, warehouse lenders, custodians, investors, and servicers, as its validity is essential for the downstream life of the loan on the secondary market. eNotes allow tech-forward lenders to maintain agile operations and achieve greater liquidity than they can achieve through traditional paper processes. As of April 1, 2019, 376,618 unique eNotes have been registered on the MERS® eRegistry. The mortgage industry can continue to expect exponential growth of eNote production in 2019. As the Dallas skyline faded into the distance, I spent some time on the flight reflecting on my experience at the conference. The acceleration of the mortgage industry’s digital transformation comes from all sides. Adoption by originators, custodians, settlement and title agents, doc prep providers, warehouse lenders, servicers, the government-sponsored enterprises (GSEs), and MERS is crucial for its success. 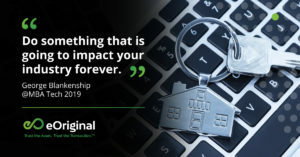 During MBA Tech 2019, it became abundantly clear that digital mortgage isn’t just a promise for the future. It’s a reality today. This entry was posted in Digital Mortgage, eNote, Events and tagged MBA, MBA Tech, MBA Tech 2019.